Digital learning practices can help achieve the goals of your knowledge ecosystem. Personalized learning solutions and services can enhance knowledge and deliver better outcomes for certification programs. An educational institution or corporate training center needs a customized approach to learning management and unique pedagogy and assessment methods. The GoVirtual Education practice helps you capitalize on technology to enhance the learning experience. A web-based content management system to create, manage, deliver, and archive knowledge artefacts in diverse formats is a learning imperative. Advanced search functionality to access relevant data reduces the cost of help desk operations. A robust user authentication method for controlling access to enterprise content ensures information security. Moreover, a comprehensive content management solution supports digital rights management. Competency profiles of employees should be created to identify skill gaps. Digital assessment tools provide an accurate evaluation of a course or skill development program. The results serve as a feedback mechanism for the learning process and system. A learning ecosystem facilitates collaboration between learners, instructors, administrators, and other stakeholders. Social learning in virtual classrooms, where learners and experts interact through video, audio, and text chats, accelerates knowledge-sharing. Students and corporate trainees can gain instant access to a knowledge repository through mobile devices. The learning modules and assessment tools should support a diverse range of mobile platforms and devices. A cloud-hosted learning ecosystem reduces IT infrastructure costs and ensures simultaneous adoption by multiple users. The exponential growth of information, heterogeneous silos, unstructured formats and poor data quality pose challenges in information management. They prevent businesses from utilizing information effectively. Business Intelligence (BI) and Data Warehousing (DW) address these challenges by unearthing the hidden value in information assets to facilitate informed decisions. GoVirtual offers end-to-end BI and DW services - Reporting and Analytics, Maintenance and Support. Our services cover Business Intelligence road map, data warehousing implementation, analytics, data mining, data quality and master data management. Our business result-oriented approach ensures return on information. 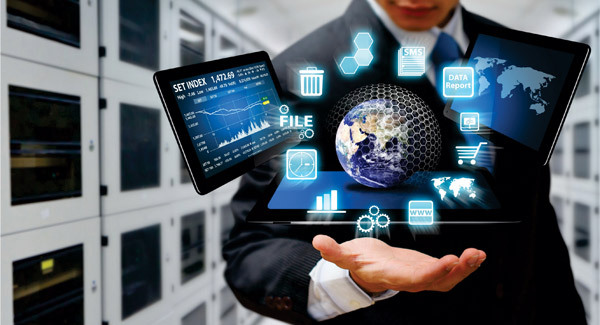 Enterprise Content Management helps in managing unstructured data by using well-defined processes for creating, managing, delivering and archiving information. Enterprises face challenges in managing ever increasing volumes of electronic documents, reducing paper trails, and supporting and integrating different content types efficiently. In addition, foundation capabilities such as security, access control, workflow, and renditions may be available only in select content-type-specific offerings. Enterprise Content Management (ECM) services from GoVirtual span the gamut of ECM, addressing document management, records management, web content management, digital assets management and BPM. These services help organizations meet business continuity, process integration and compliance requirements. Managing and securing information is central to organizational success. A well architected, federated identity management solution enables organizations to implement a sound authentication and authorization mechanism to address regulatory concerns and overcome security, productivity and efficiency issues arising from scattered, multiple sources of identity and security information. Adherence to regulatory compliance and privacy laws are also key enablers from the identity management stable. GoVirtual' comprehensive identity management framework covers the identity lifecycle (creating, managing and de-commissioning stakeholder identities). We help you implement effective access control mechanisms; maintain user information integrity and confidentiality; reduce the cost of user management; reduce the cost of helpdesk calls and application maintenance while increasing productivity. In addition, we help you maintain user information integrity and confidentiality.